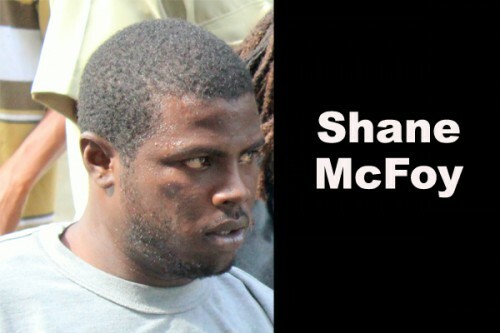 This morning, Shane McFoy, 26, an undertaker of #71 Euphrates Avenue, was charged with theft when he appeared before Magistrate Hettie Mae Stewart. Police said that on September 10, they responded to a report from Earl Perez that at 12:05 on Tuesday afternoon, as he parked his vehicle on George Street, someone sneaked up on him, pushed their hand through his opened car window, snatched his 16-gig 4S I-phone, valued at $1,200, from off his lap, and ran down the street with it. The person then handed it over to another person, and they both ran off. After police investigated the report, they apprehended Nicholi Rhys and found the I-phone in his possession. Rhys was arraigned on Wednesday, September 11; he pleaded not guilty to the charge and was offered and met bail. McFoy was unrepresented when he appeared in court and pleaded not guilty to the charge. He was offered bail of $1,000 and one surety of the same amount, but McFoy owed the court $160 from a previous conviction and had to pay that outstanding fine before he could be bailed. Up until 3:30 this evening, McFoy was still in the court’s holding cell, unable to pay his debt. He is due back in court on October 18, 2013.